Maybe you're trying to depict a four-alarm fire. Or a character simply puffing on a cigarette. 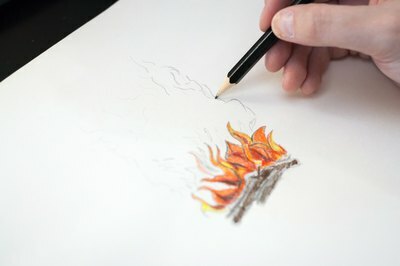 Either way, drawing smoke in one of your sketches isn't difficult, but giving it the shading and texture necessary to make it appear realistic can offer a challenge. To draw smoke, you have to capture something that is almost elusive in nature. This can be achieved, however, by using a variety of proven shading and texturing techniques. 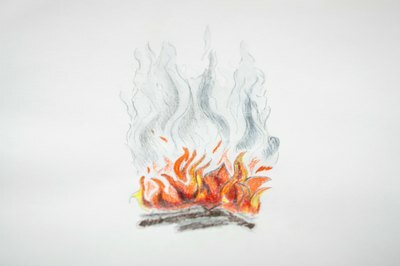 Draw a light outline of the smoke pattern you want to create. Start in the center of your paper and draw a cloud-like pattern. Keep in mind that smoke isn't perfect, so add a few thin, curled lines rising from this pattern to give the illusion of curls of smoke drifting from the cloud. Sketch random lines throughout your smoke cloud that will give it texture. Some of these lines will be squiggly and others will be curved.There isn't a set number of these lines to draw, but they should be distributed throughout your cloud. Color your smoke. This can be the tricky part. Use color pencils. Apply a layer of white coloring over the smoke cloud, then color over this with gray. 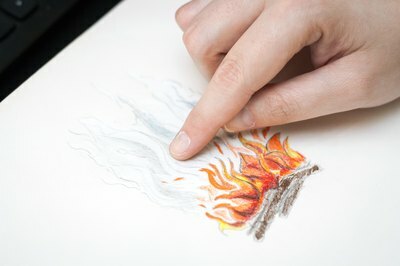 Use your finger to blend or smudge the colors into a smooth texture. Apply the gray over the white using side-to-side strokes and continue to blend until you have the grayish-white tone that looks like smoke.